In its present day form, the church is of the transitional inscribed cross type with dome. Preserved in the semi-circular apse of the sanctum is the synthronon (clergy seats). The western part of the church includes the narthex with the chapel of St. Akindynos on the north side and to the south a vaulted rectangular space. On the inner walls are five layers of decoration belonging to the Early Christian, middle Byzantine and late Byzantine periods. Architecturally the church is among the earliest churches of transitional type and is dated in the first half of the 9th century. Some architectural members are preserved from the Early Christian period providing evidence that the building was originally a basilica. Epigraphical evidence shows that the church was restored in 1052. There is also an inscription in the chapel of St. Akindynos mentioning the year 1056. Later repairs and alterations are mentioned in inscriptions of the 16th and 17th centuries. 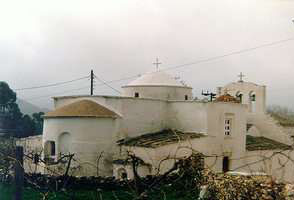 Patriarchal sigillia of the 16th century refer also to the church of the Protothrone with the chapels St. Georgios and St. Akindynos. The wall paintings underwent restoration in 1970-1972. Wall paintings were discovered in the south vault of the church and the removal of wall paintings in the dome revealed an earlier layer of paintings. The church of the Panaghia Protothrone continues in use today as a consecrated Orthodox Christian church.